Since Icestone introduced its glass terrazzo surfaces about 7 years ago, they have grown rapidly in popularity. And one of the main reasons they’ve become popular is that the beautiful multi-coloured glass that the slabs are made with is being marketed as a ‘recycled’ product. And technically, the blue, red, yellow, green and opaque white glass pieces are made from recycled glass – but at a big environmental cost. The beautiful coloured glass starts out as clear bottle glass that has been collected, washed, sorted and crushed, ready to be made into new bottles and jars. This is the most valuable recycled glass because it is readily usable in bottle production, whereas green and amber glass can only be used for other green and amber bottles. This is glass that is taken out of the regular recycling stream. The manufacturer of coloured glass then adds a colouring agent to the glass, heats it to roughly 1000 deg. C, thoroughly melts it with the colorant, then cools and crushes it. The environmental impact of this glass is about the same as if it were made into new bottles and jars, then crushed again and called ‘recycled’. Another not-so-green aspect of these surface materials is the amount of work, energy and generated waste are required to achieve the terrazzo surface. Ready-made slabs are 1.25” (32 mm) thick. When they are made, they are 1.5” thick (37.5 mm). The difference of 1/4” is turned into dust by the grinding and polishing machines, so that the glass could be exposed. This dust is not recyclable or reusable in any product or process, and it goes straight to landfill. How are ECClectic Surfaces different? We also use recycled glass – but the glass we use is mixed-colour, broken shards that are rejected by recycling plants. These glass pieces are too small to sort, so they get thrown into the reject bin at the waste sorting stations. A company just outside of Hamilton, ON takes this glass, steam-cleans it and crushes it into sand-size particles. This glass is then sifted by size and sold as sandblasting abrasive, however, we buy the glass before it is sifted, so we get a full spectrum of particle sizes, from powder to about 2 mm diameter. This glass is not only a truly recycled product, with the lowest possible environmental footprint, but it also gives us excellent, predictable quality in our ECC. It is always fully dry, with no surprise gaps in the spectrum of particle sizes – exactly what is necessary for making good concrete and ECC. 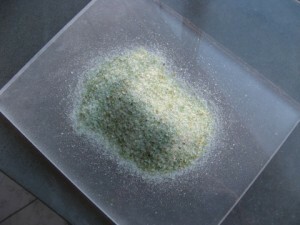 This recycled glass is not pretty – you can see clear, green and amber pieces, with the occasional blue shard mixed in. You also see bright coloured bits of plastic, from bottle caps, as well as bits of metal from jar lids. So it’s just as well that we don’t grind to expose this glass – and we don’t create mountains of dust in the process. Any composite material, whether concrete, ECC or engineered solid surface, consists of an inert aggregate (in this case, glass) and a binder that holds the aggregate together. In concrete, the binder is cement mixed with water. In ECC, the binder is a blend of cementitious powders (including cement), mixed with water and other liquids. In engineered surfaces, the binder is polyester or acrylic resin. In every case, the aggregate is the main ingredient, so for calculating recycled percentages, it is easy to inflate the recycled numbers by using more or heavier aggregate. However, the binder has a far greater environmental impact than the aggregate. The carbon footprint of cement is much greater than that of sand, gravel or glass aggregates. The carbon and toxic footprints of resins are thousands of times greater than the carbon footprint of any aggregate. The glass replaces the material that has the lowest environmental footprint. None of the “recycled glass surface” producers has taken any steps to reduce the footprint of binders. On the other hand, we have replaced over 60% of our binder with recycled ingredients, and we are always investigating ways to raise that proportion without compromising strength. Please don’t get taken in by the marketing hype of these terrazzo glass surfaces. If you like the look, by all means buy them, but don’t imagine that you’re doing anything for the environment by doing so.